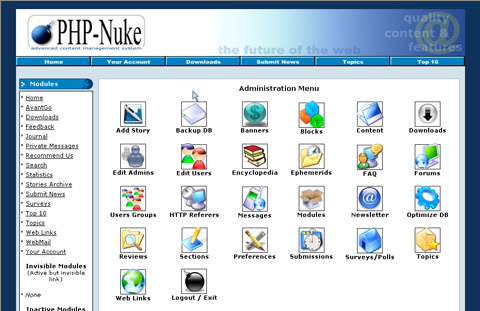 PHP-Nuke is a Web Portal System, storytelling software, News system, online community or whatever you want to call it. The goal of PHP-Nuke is to have an automated web site to distribute news and articles with users system. Each user can submit comments to discuss the articles, just similar to Slashdot and many others. Main features include: web based admin, surveys, top page, access stats page with counter, user customizable box, themes manager for registered users, friendly administration GUI with graphic topic manager, option to edit or delete stories, option to delete comments, moderation system, Referers page to know who link us, sections manager, customizable HTML blocks, user and authors edit, an integrated Banners Ads system, search engine, backend/headlines generation (RSS/RDF format), and many, many more friendly functions. PHP-Nuke is written 100% in PHP and requires Apache Web server, PHP and a SQL (MySQL, mSQL, PostgreSQL, ODBC, ODBC_Adabas, Sybase or Interbase). Support for 25 languages, Yahoo like search engine, Comments option in Polls, lot of themes, Ephemerids manager, File Manager, Headlines, download manager, faq manager, advanced blocks systems, reviews system, newsletter, categorized articles, multilanguage content management, phpBB Forums included and a lot more. 1. Download latest phpnuke from http://www.phpnuke.org/. 2. Decompress the package to a directory under your web document root directory (Only the files and directories under /upload sub folder). For example, if your web document root directory is c:\inetpub, extract the zip package into c:\inetpub\phpnuke. [required] mysql : The mysql is not included in RaidenHTTPD; you need to install manually it. Note: 'source c:/inetpub/phpnuke/sql/nuke.sql;' executes a sql file in your phpnuke package. You should change your path if it is different than our example. If you do not see anything, please verify your config.php again. Now it is time to setup your admin account. 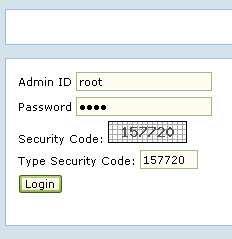 After your admin acount has been created, login the system with this account. You will see the security code on the screen and you repeat it again. This security code retyping step prevents bots from using your system. Now, you can explore the features of phpnuke by trying out a lot of things, such as adding some news, downloading news, or customizing your phpnuke. 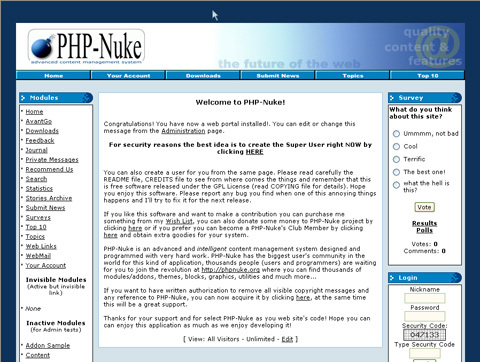 When you are done, click the home link to see what does your phpnuke portal site look like. Now, your phpnuke is ready for use and you may ask some friends to visit it at the url of 'http://YOUR_SERVER_IP/phpnuke/html/'. 1. Once you are done, you can remove the following items from your web directory or just simply move them outside of your web root directory.